Northwestern freshman receiver JJ Jefferson leaps for a pass that ended up falling incomplete. The Wildcats scored zero points after their opening drive Saturday. Northwestern’s two-quarterback system may get all the attention, but it was the Duke defensive line that dominated in the Blue Devils’ 21-7 victory Saturday at Ryan Field. Both senior Clayton Thorson and junior T.J. Green struggled all afternoon to find time to throw, as Duke piled up four sacks and forced 13 hurries, many on crucial third and four downs. After marching down the field on the game’s opening drive, the Wildcats’ offense scored no points on the next 13 drives. Both starting offensive tackles, senior Blake Hance and sophomore Rashawn Slater, left the game with injuries. NU capably moved the ball at times, but sacks and pressure in key situations kept the Cats from converting opportunities. The Mick McCall-led unit was 1-for-5 on 4th down conversion attempts, and Fitzgerald was clearly loathe to trust sophomore kicker Charlie Kuhbander from long range, twice going for it on fourth down plays of nine or more yards with the ball between the Duke 30 and 40 yard lines. Thorson once again saw the bulk of the playing time in the two-quarterback system, completing 22 of his 38 passes for 198 yards. He struggled to complete deep passes throughout the day, and his sole interception came on a long throw into double coverage. Green, for his part, threw only 18 passes, one of which was also intercepted. He finished with 84 yards on nine completions. Duke quarterback Daniel Jones, coming off last year’s 400-plus yard performance against NU, looked like a Heisman candidate in the first half, throwing for 159 yards and only tossing three incompletions, but he led the Blue Devils offense to only 32 total yards in the third quarter before leaving with an apparent arm injury. The injury came after a sack by Joe Gaziano, one of two the senior defensive end recorded on the day. Gaziano had four tackles for loss and was a general menace in the Duke backfield throughout the second half. Despite the impressive defensive effort, the Cats sit at 1-1 after six straight quarters of offensive ineptitude. Between the second half at Purdue and Saturday’s effort against Duke, NU has totalled seven points in its past 90 minutes of play. 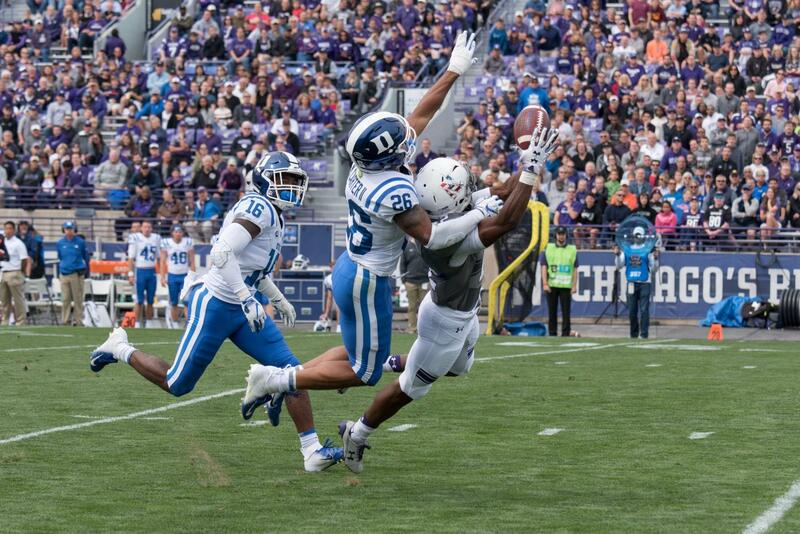 In 2017’s loss, the Cats were thoroughly outplayed from beginning to end, but on Saturday, NU outgained Duke by 80 yards, committed fewer penalties and had greater time of possession. Sophomore running back Jeremy Larkin shined again, rushing for 124 yards and adding 55 more through the air on seven catches. Senior wide receiver Flynn Nagel, who had a career day with 12 catches and 133 receiving yards, was optimistic after the game.